“Huh?” Deadpan’s voice sounded startled, but there was no change in the expression on his rugged face; there couldn’t be. Years ago, after a peterman had left nitroglycerine all too conveniently located for the detective to find, a surgeon had given him a face which would pass inspection, but which was as fixed and changeless as a mask. Chief Walworth took a moment to calm down before he could answer. Then he took a pencil from his pocket, went into elaborate detail in drawing a map. Deadpan nodded as casually as though he had expected it all along. He yawned again, then drifted toward the door. Deadpan managed to close the door behind him before the chief could ask him what he wanted to make sure of; he wasn’t quite sure of that little matter himself. Nick Rapelje, the janitor, was sweeping at the other end of the corridor. Deadpan strolled down near him, leaned against the wall. The janitor stopped work. “Sure, Mr. Dunn, sure. My Mike, he’s three; my Tony, he’s five and a half; my Polly, she’s—” His hands were making gestures resembling steps. “No, no, Nick. Your kids are all right. Maybe I’m crazy, but don’t let that worry you.” He drifted away from the janitor, laboriously climbed two flights of stairs to the bureau of identification office, sat down on Captain Miller’s desk. In the front office, Deadpan stopped beside Betty Shires’ desk, waited until her typewriter stopped clicking. Her eyes widened, she looked at him closely—and then remembered. You couldn’t really ever tell whether Dunn was kidding or not; his expression was always the same. “This dragon did,” said Deadpan. He moved away hastily before she could ask questions. HE slowed down and when he reached the corridor he sauntered back toward the chief’s office. He opened the door and thrust his head into the room. Deadpan closed the door to avoid listening to the rest of it. 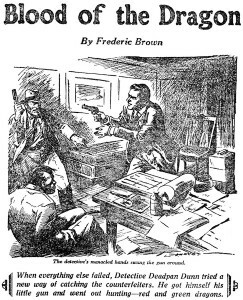 He went to his own desk in the general office, and from the top drawer he took a flat .32 automatic, put it into his coat pocket. Outside the building, he climbed into his roadster and drove out past the city limits to the country home Chief Walworth had purchased the previous year. The chief’s wife was on the front porch, knitting. Deadpan took off his hat as he climbed the porch steps. “Where’s Dorothy, Mrs. Walworth?” he asked. Deadpan managed polite apologies and got away, feeling sure he hadn’t awakened suspicion or apprehension. He took the first two and a half miles at a good pace, then slowed down, leaving the path but walking parallel to it through the woods. When he came to the edge of the glade, he stopped, looked out through screening branches. There, in the open, was the shallow creek beside which Dorothy had been playing. Beyond the creek, the slope of the hill and at the top of the hill, the cabin. THE CREEK was quite close to where he stood; he could see the marks in the sandy soil where the child had played. Ruins of sand castles showed that she had lingered long. There were the three flat stones on which she would have crossed the shallow creek, started up toward the cabin. Moving cautiously now, Deadpan skirted the clearing, crept up to the back of the cabin. One window there had been boarded up, the glass broken. The glass of the other window was so caked with dirt he couldn’t see through it. He listened for a long time, hearing nothing, before he went around to the front of the cabin, tried the door. It opened easily. There was no partition in the cabin, and from the doorway he could see that it was empty—empty, that is, of human beings. Its inanimate contents were ample proof that his hunch had been right. There was a small hand-press in one corner, and, besides the two cots and the oil stove, there were two tables covered with engravers’ tools and equipment, stacks of paper, boxes. . . . Deadpan put one foot out toward the doorstep, pulled it back. His sharp eyes had caught a glimpse of a fine thread stretched knee-high across the doorway, a black thread so fine as to be almost invisible. Leaning around the doorpost, he traced the thread as it bent around a nail, led toward the ceiling above the doorway. Then, standing well outside the door, he broke the thread with a thrust of his foot, heard the thud and saw the fall of the heavy sandbag from the ceiling above the door. He rolled it aside and went on into the cabin, crossed to one of the tables where the gleam of copper plates had caught his eye. He was still engrossed in studying the intricate beauty of the engraving on those plates when the two shadows appeared in the shaft of sunlight that came through the open doorway. He dropped the plate, whirled, but a quiet “Don’t try it” stopped his gesture toward his pocket. That and the sight of the revolver muzzle that aimed straight at his belt buckle, too close to miss. The shorter of the two men stepped behind him, slipped the automatic from the pocket of his coat. Expert hands ran over him in search of another weapon, took a pair of handcuffs from his hip pocket. And he anticipated rightly. At the click of the second handcuff, the vigilance of the man behind the gun relaxed momentarily. The hands of the other were still at the detective’s wrists. With the suddenness of a striking snake, the detective went into action. HIS HANDCUFFED HANDS grasped the coat-sleeves of the man who had just snapped the cuffs, swung him around directly in front, in the line of fire. Then he suddenly pushed with all his weight, shoving him backwards against the gunman. The first man went down. The detective was past him in an instant, and before the deflected gun could be swung toward him again his manacled fists lashed out together, straight for the gunman’s chin. The man went down; the gun clattered on the floor. 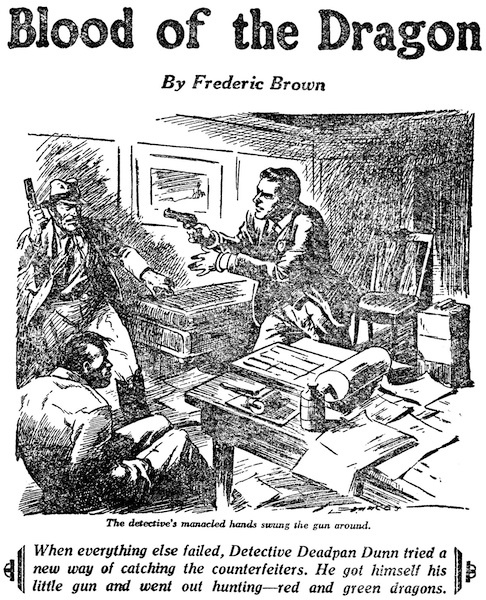 The detective’s heel came down on the fingers of a hand that clutched for the gun. Then he had it himself, swung around in time to blast his own automatic from the hand of the smaller of the two counterfeiters, who had just yanked it from his pocket. The automatic dropped as the counterfeiter clasped a shattered right wrist. Suddenly the room was silent. “Okay, boys,” said Deadpan. “Go ahead and pack the plates, just like you were going to. We’ll take ’em along.” He waved the weapon ominously. . . .
Chief Walworth looked up as Deadpan reached across his desk for one of the chief’s Havanas. “I get it all,” the chief admitted. “All but one thing. The kid plays at the creek in sight of the cabin. They know if she comes on up, it’s gotta be curtains for them or for her—or both. Deadpan took an envelope from his pocket; from it he poured onto the desk a little pile of dark-red powder. Chief Walworth gazed at the little pile of red powder.